This notice is to alert you to a potential health and safety issue affecting a small portion of a specific bottling run of Tank 7 12-ounce six-packs. Following a consumer report indicating the presence of glass in a bottle, we initiated an immediate inspection and joint investigation with our glass bottle manufacturer. The supplier determined that they did not properly respond to a short-lived production issue, creating some out-of-spec bottles that were shipped to us. These bottles may contain small amounts of excess glass that can become detached and slough off into the beer. The bottles in question were used during a brief portion of a Tank 7 packaging run. The resulting cases of six-packs were distributed on the Missouri side of the Kansas City metro area and in Omaha, Nebraska. Accordingly, for those consumers who purchased six-packs of Tank 7 in Greater Omaha, Nebraska on or after December 17, 2018, or on the Missouri side of the Kansas City metro area on or after December 28, 2018, we are recalling select 12-ounce bottles, as described below. The following image explains the coding on our bottles to allow you to determine whether you have any of the affected bottles. These can be identified by checking the top line of the white code information ink-jetted onto the shoulder of the bottles. 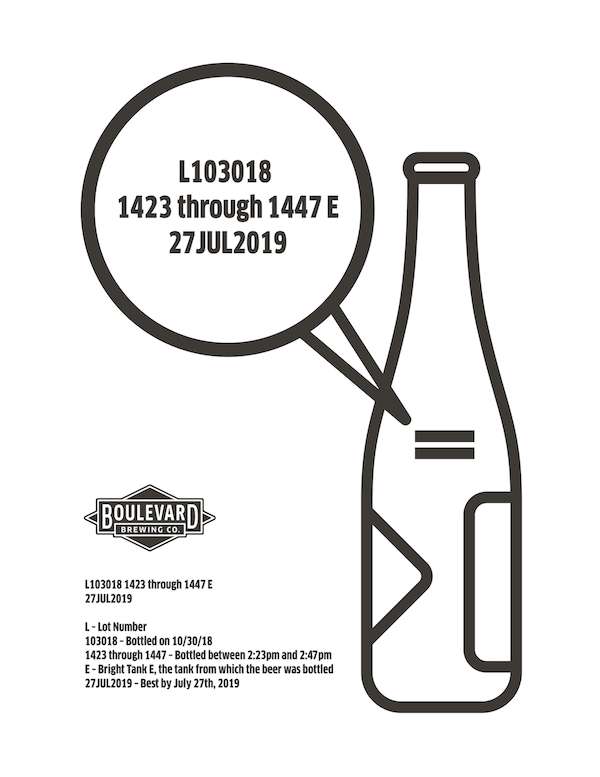 The first portion of the packaging run in question reads L103018, and the last four digits of the recalled bottles, representing the time of bottling, are 1423 through 1447, inclusive. All bottles with different codes, or with time stamps outside this window, are unaffected. If you are in possession of bottles from this portion of the bottling run, do not drink the beer, but destroy it after applying for and receiving confirmation of your refund. Please head to www.boulevard.com/refund or email refund@boulevard.com for a refund of your purchase price. Our top priority is the health and safety of our customers. We pledge to learn from this situation and to redouble our efforts to brew and package only the finest ales and lagers that you’ve come to expect from Boulevard Brewing Company. If you have any questions about this release, or any other Boulevard offering, please do not hesitate to reach out to us. We sincerely appreciate your cooperation, understanding and support. We’ll have someone available to respond within normal business hours, from 8:30a-5:p CST at 816-474-7095. If you need help after business hours, please leave a message and someone will return your call as soon as possible.